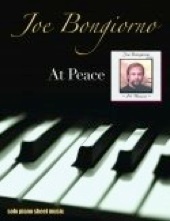 The At Peace songbook is the companion sheet music book for Joe Bongiorno’s 2000 debut CD by the same name. 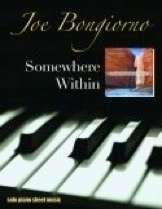 All eleven tracks were transcribed note for note, allowing the pianist to see and feel exactly how Joe plays the music. Like his other songbooks, At Peace’s pieces are mostly early-advanced level, with some a little easier than that, and a couple of them a bit more difficult (key signatures and extensive leger lines). The guidelines below will let you know which pieces are more challenging and which keys the pieces are composed in. Most of the music is slow and flowing, and both hands play a limited number of chords. The notes are generally eighth note broken chords that run one note at a time. The music is printed on a heavy paper stock that will stay looking good for a long time. The notes are crisp and easy to read, and the spacing is roomy and not intimidating. There are a few long reaches, but an average-size hand should easily be able to handle most of the intervals. 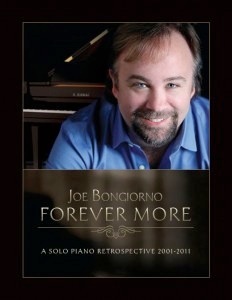 At Peace will give many hours of playing enjoyment and will give pianists an opportunity to see how Joe’s music has evolved over the past ten years. 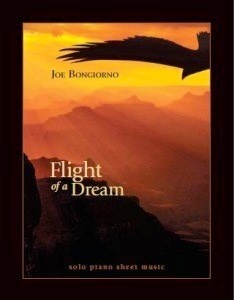 The book is available from Joe’s website, and I recommend it! The contents of the book are listed below in the same order that the songs appear in the book. I’ve included a difficulty ranking with 1 being the easiest of Bongiorno’s pieces and 5 the most advanced. I have also indicated what key the pieces are in, how many sharps or flats there are in those key signatures, and how many pages the songs are.